With the support of Elders and teachers, Nala’atsi School gives Aboriginal students roots and wings. It’s popular these days to use the word “terroir” to denote the influence of place on the character of wine, store coffee or food (the word originally meant ‘soil’ in French). But after spending some time with up-and-coming Comox Valley musician Luke Blu Guthrie, ailment I’m starting to think that “terroir” can apply to culture as well. I met with Guthrie, a songwriter, singer and guitar-player, in the cozily hip Cumberland hangout Tarbells. 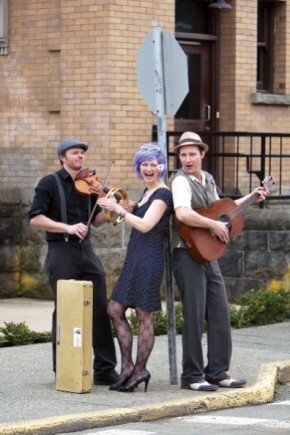 We were joined by his band members Jenn Forsland (back-up vocals and auxiliary percussion) and Jack Roland (fiddle) for an unhurried conversation about their new CD, their musical influences and ambitions, and why they think the Comox Valley is a great place to be a musician. In person, Guthrie has an unassuming charm and a friendly, laid back manner. He leans back comfortably in his chair, pauses before speaking, and answers questions simply, with occasional flashes of a mischievous humour. Forsland, on the other hand, speaks quickly and with impressive eloquence. I’m not surprised to hear she is a teacher (music at Courtenay Elementary); I have no problem imagining her commanding a classroom with her articulate energy. Roland seems to be the quiet one, which may be because he has a heaping plate of delicious Tarbell’s food in front of him. He speaks up when there’s a good story to tell or a funny line to add. Guthrie says much of what he does is influenced by his home. He grew up at The Hermitage, a unique collaborative back-to-the-land project in Merville, which provided him with what he calls “a simple, rural lifestyle surrounded by a cast of eccentric and colorful characters.” This upbringing has influenced both his music and his personal journey in multiple ways. “I feel very connected to a simple rural existence. I like to keep things pretty simple and honest. This kind of naturally feeds into my interest in roots music,” he says. That doesn’t mean that his musical horizons are narrow, however. On the contrary, his influences range widely through place and time. He describes his style as a “fusion of folk, funk, dark country, rock ‘n’ roll, soul, blues and swing.” His interest in many of these genres dates back to his childhood. “Lucky for me, I was exposed to lots of eclectic and old music when I was a kid, like folk and jazz tunes, a lot of old spirituals, prison songs, things like that going right back to the 20s and 30s. And I remember discovering Bob Marley when I was about seven. I wore that old tape to the bone.” And then there was the other Bob—Dylan—who has been a life-long influence. “Also, my name comes from a family of slaves in Ohio and looking into my own roots led me to get really interested in the music and of the Southern States. And since then I’ve been introduced to many other styles that I love but still, what moves me most is the raw emotions of those early songs,” he says. Apparently the “school of street’ has worked well. Guthrie, now 26, has been performing solo and with other musicians for about 10 years, and since forming his band about seven months ago, his star has been steadily rising, as evidenced by their busy schedule. Part of what’s energizing Guthrie these days is his band. Although he is the songwriter and front-man, Guthrie says the group works in a truly collaborative way, bringing together diverse backgrounds into a creative partnership that is personally fun and creatively fertile for all three. Forsland agrees: “In a relatively short period these lovely people have endeared themselves to me,” she says. “We have developed a really deep and genuine respect and trust. The vibe we feel together is just great. And this really comes across on stage. Forsland is a seasoned musician, but playing with Guthrie is a marked departure from anything she’s done before. Her training was very classical in focus, very much about music theory and reading notes, she says. She has a degree in music and education from the University of Victoria. “I was introduced to jazz in high school and it blew my mind totally, taking me 180 degrees from where I’d been,” says Forsland. For the past 15 years, Forsland has been performing in classical and jazz genres, and currently fronts the Jenn Forsland Group, a six-member band that performs jazz and light pop. Roland’s background is equally steeped in music, but in a completely different way. He grew up moving back and forth between Salt Spring Island and the Comox Valley. “These are two pretty amazing places. I’ve been pretty lucky,” he says. Roland comes from a musical family. He can’t even remember when he first started playing an instrument, but he does remember joining his first band. “My dad played in a bluegrass band and a kind of R&B band. One day my dad said his band needed a fiddle player. I said I’d play,” he explains. He was eight years old. Roland has spent his life immersed in music. This included classical training for six years and a summer with CYMC, which he loved. He’s also done a lot traveling—in Europe, North Africa, and the United Kingdom—which opened up some really fun musical doors for him. “I hooked up with musicians everywhere I went. I jammed, I toured and I played with a lot of strange ensembles,” he says with a big grin. And like Guthrie, he did a lot of busking, not just for fun but as a means of survival. “I’d wake up on the street, early in the morning,” he recounts with a happy grin. “It would be early morning; there was no one out there, but I’d start playing anyway because I was hungry. A shopkeeper might come out and throw me a piece of bread. The connection between these three musicians has given birth to their CD, simply entitled Luke Blu Guthrie (available at Bop City in Courtenay and Seeds Market in Cumberland). The 10 tunes here showcase the trio’s wide range, with a rootsy vibe, funky beats and soulful melodies wrapped around Guthrie’s thoughtful, sometimes humorous lyrics. “I like to think the CD shows how a real variety of influences and sounds can amalgamate into something really interesting,” says Guthrie. The CD was made in 30 hours, which gives it the sound of a live session. It includes contributions from Jim Guthrie (no relation to Luke) on stand-up bass and Anela Kahiamoe on electric bass. Guthrie hopes that the CD will help his band connect with more listeners and get more exposure. Like most musicians, he would like to get bigger gigs and develop a larger following. But at the same time, he is content with where he is now. Much of Guthrie’s contentment comes from his appreciation of the Comox Valley. He spent some time in Vancouver, lured by the elusive promises of the big city, but he fairly soon realized that the Valley was where he really wanted to be. “I like the rural life,” he says. “People here seem to recognize that quality of life comes first. And growing up as I did at the Hermitage, I really became aware of the value of community. After living in Vancouver, that’s what brought me back. This is a place where you can know your neighbors, you know where your meat comes from, you stay connected to nature. That’s better than feeling cool ‘cause you live in the big city,” he says with a laugh. Clearly, Guthrie thrives by staying close to his roots. With a childhood spent tramping the forests and fields of Merville, school years spent at Courtenay Elementary and Vanier, and a craft honed on the not-so-mean streets of Downtown Courtenay, he’s very much a product of the Valley. I’d employ the word “terroir” to describe his musical flavor if only I knew how to use it in a sentence. Instead, I’ll suggest you get out to a local venue to see some truly local music. For more information on Luke Blu Guthrie, including a list of upcoming gigs, go to: www.lukebluguthrie.com. It’s popular these days to use the word “terroir” to denote the influence of place on the character of wine, coffee or food (the word originally meant ‘soil’ in French). But after spending some time with up-and-coming Comox Valley musician Luke Blu Guthrie, I’m starting to think that “terroir” can apply to culture as well. the smell of coffee, and the visual stimulus of walls, tabletops and bookcases filled with expressive art. No, it doesn’t feel like a school building… it feels like a home. I am visiting Nala’atsi after hearing one of its teachers, Toresa Crawford, and two of her students, talk about the program at a Courtenay Rotary Club luncheon last fall. At that presentation, Crawford explained that this unique school for Aboriginal youth was started in September 2000. Its purpose was to address the fact that an increasing number of secondary school-aged Aboriginal students had either left school, were at risk of dropping out of school, or were on the waiting list to get into the only other alternate school option—City Centre—in the Comox Valley. Crawford explained that research conducted by School District 71 in 1999, had shown that for a variety of reasons, the traditional school system wasn’t working for many Aboriginal youth. When asked what they wanted in an education, the list of requests included a school that would focus on independent study and small group activities; a centralized location; an exclusively Aboriginal program; Aboriginal content and cultural opportunities; eligibility for a Dogwood Certificate; and more flexible schedules to accommodate work, parenting and other lifestyle considerations. In response to the research and valuable feedback, School District 71, in consultation with Aboriginal groups in the Comox Valley, opened this alternate high school program. The name ‘Nala’atsi’ was chosen by Elder Mary Everson. Nala’atsi means ‘Place of the Day’ or ‘New Beginning’ in the Kwak’ wak’wala language. Nala’asti’s first location was the basement of a house rented by the Wachiay Friendship Centre, a non-profit organization that provides cultural support services for Aboriginal people in the Comox Valley. Ten students attended the school that first year. It was considered a great achievement when two of the 10 students graduated and another two upgraded so that they could get into post-secondary school. The other six continued with their studies the following school year. While the curriculum and teaching model was successful, the inaugural facility neither resembled, nor met, the physical standards of a school, so the program was relocated three times over the next few years. The relationship with the Wachiay Friendship Centre, however, proved to be a success from the beginning and it continues to be an integral part of Nala’atsi to this day. Nala’atsi is now located at the new Aboriginal Learning Centre, 665 – 16th Street, behind Courtenay Elementary School. The 3,000-square-foot building has two large open-concept classrooms, private meeting rooms, a full kitchen with dining space, an exercise room filled with donated equipment, an Early Head Start area for young children, as well as offices for the district principal of Aboriginal Education and the Aboriginal curriculum support teachers, who develop and deliver programs on Aboriginal culture, history and traditions for students. 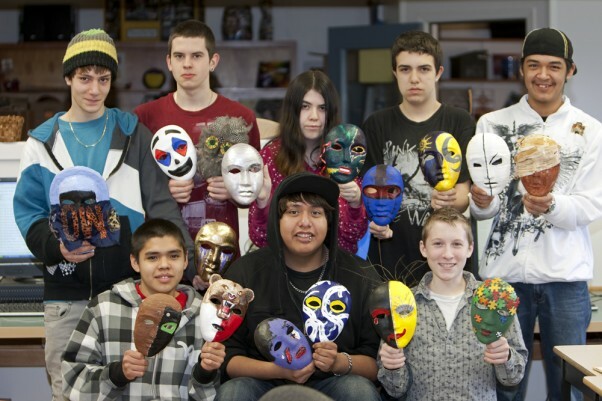 Nala’atsi students display some of the 30 masks they created. “By looking at the masks and reading the corresponding write-ups, you can ‘listen’ to the message each creator was trying to convey,” says teacher Toresa Crawford. Students and parents alike rave about the safe and supportive environment that has been created at Nala’atsi; the flexible timetable and the one-on-one help available because of the low pupil-teacher ratio. Students feel welcome in the building and they can concentrate on learning at their own pace, rather than having to deal with the stresses that often come about in a larger high school. A major strength of the program is the multi-generational influence of the Elders who come to the school on a daily basis. The Elders are an important connection to Aboriginal history and are positive role models for the students, as well as a source of encouragement and support. The Elders are the ‘roots’ that these youth need to feel proud of their culture. Combined with the guidance of teachers and support staff, the students gain confidence and the ‘wings’ to help them soar. 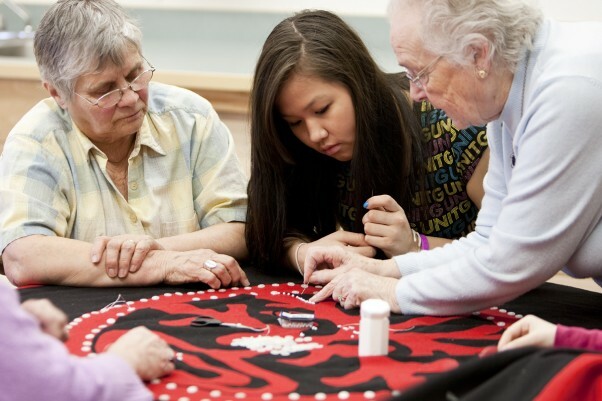 The day that I visit Nala’atsi, a group of Elders are gathered around a table hand-stitching buttons onto a traditional ceremonial robe called a ‘Button Blanket.’ The garment is worn during Potlatch celebrations. This particular red wool cape is being lovingly created as a fundraiser for a local family. It features a generic tree of life design in black. Other designs that you might see on these blankets are specific to particular families and are passed down for generations. Today, the women are sewing regular white buttons onto the blanket; generations ago, their ancestors would have used bits of abalone shells. As the women sew, they talk about how much they enjoy coming to Nala’atsi to be with the kids. Multi-generational interaction is an important part of the Aboriginal culture and, the Elders explain, it benefits everyone. The other Elders—not all of whom are First Nations people—nod their heads in agreement. They don’t let me leave until I, too, have sewed a button on the blanket. While we are chatting (and sewing), staff and students bustle around us, preparing a hot lunch that is served family style in the large kitchen. Staff, Elders, students and guests all sit down together to enjoy a hearty meal, lively conversations and lots of laughs. If you happen to be in the school over the lunch hour, expect to be fed! With a student body that encompasses a vast array of societal challenges—from racism, to personal or family addictions, to mental health and behavioral problems, to poverty, abuse and more—it is interesting to note that students who had experienced behavioral difficulties in their previous schools are blossoming in this more intimate, relaxed, multi-generational environment. In the rare case where a problem occurs, a healing circle is effectively used as an alternative to administrative punishment. In addition to working through the provincial high school curriculum, each student’s timetable is rounded out by having guest speakers come to the school, attending community field trips, physical fitness activities, mini-courses in First Aid, Food Safe and WCB Workplace Safety, as well as extensive work experience, resumé writing instruction and community service. These valuable activities also contribute to the future employability of the students, building their confidence and self-esteem, and greatly increasing their chances of earning a high school diploma. Crawford, who was the school’s first full-time teacher, explains with pride that over the past 10 years, more than 300 Aboriginal students have benefited from the nurturing environment at Nala’atsi. This year there are two teachers, a youth and family worker, 24 students and a support network of well-respected Elders. It is these 24 students who have, along with some of the Elders and community members, created a series of 30 masks that are laid out on a table in one of the main rooms. At first, I am drawn to the masks because I am intrigued by the artistic expression and creativity that has obviously been poured into this unique group project. Any art medium was permitted in their creation—from buttons or feathers to puzzle pieces, paint, glitter and more. The masks are colorful, abstract and extraordinary. Each mask is accompanied by a small write-up. The manuscripts vary in literary style and length. Some are short, but poignant. Others are more rambling monologues. All cast some light on the issues of the lives and times faced by the Nala’atsi youth and Elders. Some are an obvious celebration of triumph; others depict an ongoing struggle and teenage angst. “The mask project was funded with grants from Literacy NowBC and the Ministry of Children and Family Development (MCFD) Aboriginal Outreach Team,” explains Crawford. A delightful young woman named Emily is painstakingly photographing each mask so the pictures can be made into a large poster and published, along with the write-ups, in a book. This book and the accompanying poster will be a visual reminder for the students of their feelings and beliefs. As she carefully adjusts the digital camera settings and continues to work on her task, Emily tells me that this is her first year at Nala’atsi. She is in Grade 11 and, after only a few months, she has already noticed her grades have improved. She loves the school because “there is no peer pressure, there is one-on-one help from the teachers and I have learned to set goals.” While once at risk of become a dropout, Emily now dreams of going to college. Next, I sit down to chat with Jeremy, Brandon, Michael, Jordan, Richard, Kieran and Patrick. The boys explain that they felt lost and out of place in a mainstream school. Bullying was an on-going problem. For their learning style, everything was too rushed, structured and intense—with so many different teachers and assignments they couldn’t keep up. Nala’atsi, on the other hand, allows them to work at their own pace and help is provided whenever it is requested. They all agree that having the Elders in the school makes it fun; they enjoy hearing their stories and appreciate the fact that the Elders take the time to listen, in turn, to them. They also talk about goals for their future. Goal setting, explains Youth and Family Support Worker, Karen Hlady, is a major part of Nala’atsi’s curriculum. Each student is guided through the ‘Circle of Courage’ goal-setting program, which is based on a philosophy developed by Dr. Martin Brokenleg, a Lakota professor well known for his teachings on reclaiming Aboriginal youth at risk. The Circle of Courage is a medicine wheel made up of four quadrants: Belonging, Generosity, Mastery and Independence. Brokenleg teaches that these capacities are inherent in each of us and all need to be relatively balanced for us to live balanced social lives. It’s fairly obvious that any services directed toward children need to foster all four of these areas and in this capacity, Nala’atsi delivers. Hlady works closely with the teachers to help the students establish written goals and to evaluate their progress over the school year. “The Nala’atsi program provides a home away from home for not just our students but also to any visitor who enters our building,” adds Bruce Carlos, District 71 Principal, Aboriginal Education. For more information on the Nala’atsi School program visit: www.sd71.bc.ca.